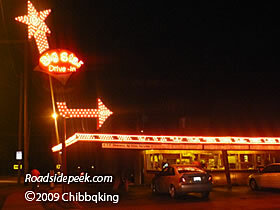 O'Ryans Village Candy Blog: End of the Season for Big Star Drive In. Once again Labor Day weekend marks the end of the season for Big Star Drive-In in Kenosha, WI. Big deal huh? Well to all the locals around here it is. The buzz starts in early Spring as to when they will open for the season. The opening weekend draws crowds worthy of a Rockstar's arrival. Through the first week of opening, residents rearrange their scheduled dinner plans to fit in a stop at Big Star. All through the Summer the Nostalgic little Drive-In stays sufficiently busy. As Labor Day draws near, everyone watches for the signs to be posted marking the official "Season Ends" date. This year it was September 4th. Signs were posted and again plans we rearranged to squeeze the final visit in. Being a Nostalgic kind of guy, I appreciate what Big Star represents. I, after all am the one who goes on about things changing and why can't the good old things remain. Big Star has remained, and is an Oasis of the good old days way of doing things that keeps us looking back. The Neon, the hundreds of light bulbs ringing the canopy, and the carhops, and burgers, onion rings, shakes, and Root Beer in a mug are all the things that make us look forward to Big Star every Summer. Good food, not necessarily great food like one could find in many other places, but maybe the fun and nostalgia of times past keeps us coming back for more. I didn't grow up in Kenosha and never knew about Big Star. When my wife and I started dating I quickly learned about this Holy Grail of burger stops that everyone flocked to in town. She grew up here so therefore she knew about it. I never really latched onto the whole allure of the place, it was just a drive in like the ones from my hometown. But as my kids grew up here, it became a part of their culture and of course mine. Having a passion for the old days as I do, Big Star now means more to me than just burgers and shakes. We started our Old Time candy business because of our childhood. My wife and I both grew up with a Ben Franklin dime store in our neighborhoods. Our first candy store was across the street from where her Ben Franklin used to be. We wanted to bring that pleasure back to the kids that lived in the neighborhood after Ben Franklin was gone. Now we bring it to the neighborhoods all over the World thanks to the Web. The importance of Route 66, The Mickey Mouse Club, '57 Chevys, Drive-In theaters and burger stops, Rock and Roll, and the Corner Candy Store is about more than History. It's about American culture and what makes this land like no other in the World. So farewell to Big Star til next year. Come Spring, attention will be on your windows for the hanging of the signs telling us when we can start scheduling our trips back in time. Thanks for listening, and Have a Sweet Day.